True to our Holistic, Meaningful, Harmonious philosophy of Education ACS Athens aspires to help develop well rounded, healthy, responsible global citizens. Being aware of personal strengths and weaknesses and developing resilience is necessary to achieve such goals. The Mindfulness Center at ACS Athens was developed with this in mind. Assisting students, faculty and administrators to achieve and maintain a mind-body balance and developing inner peace via workshops, and daily practice strategies including Tai Chi. What Does it Mean to be Healthy & Well? 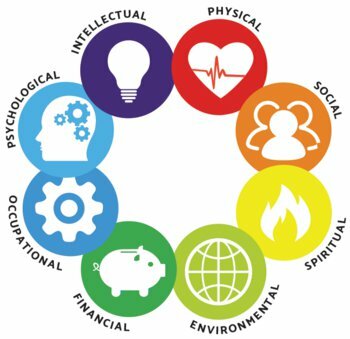 Reflection: Being Healthy and Well encompasses specific domains of our lives: a) physically, b) socially, c) emotionally and d) cognitively (see wellness wheel for more domains). How do each of the Wellness Wheel domains affect you and your every life practices (a-d above)? Reflection: Think about your every day routines and schedules, how do you take care of yourselves via these domains? Reflection: Home & School: What do they look and feel like across the Wellness Wheel domains? At our Wellness Center, social-emotional support is provided to students Jk-12 in confidentiality, individually or in small groups. Some reasons as to why an individual may reach out for support could be related to peer and/or family relations, academic concerns, loss, stress, changes in life or natural developmental changes across one’s life cycle.